Mimi G Tip: Using What You Have To Make Patterns Work! Hi Darlings and HAPPY NEW YEAR!! I am excited to see what the new years brings us. 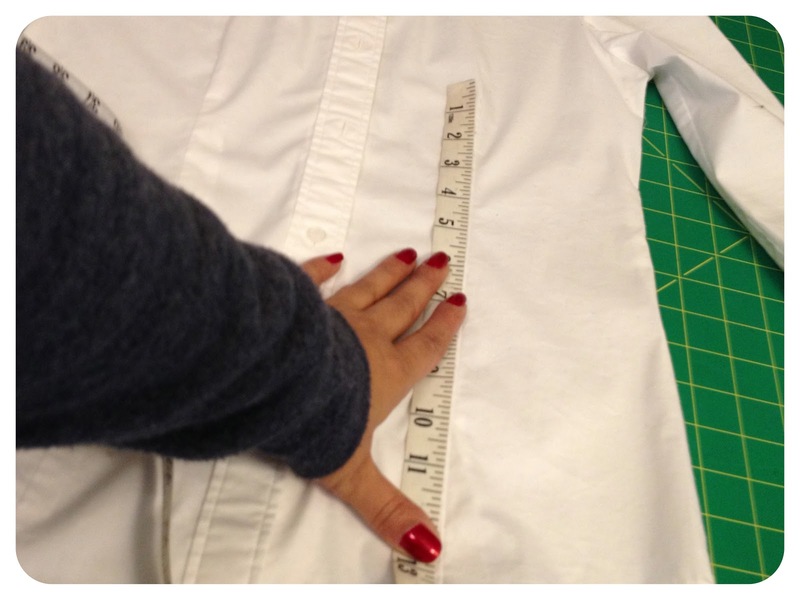 Today I am sharing a tip with you on how I use my favorite RTW items to get accurate fitting measurements for my commercial patterns. I am working on the editing of a new tutorial that should be up next week and where I will be covering the basics of learning to sew along with the much anticipated: "Learn To Read + Sew Patterns" Understand the sizing, fit, cutting, fabric selection, construction and more all in a 3 part video where I walk you through completeing a garment BUT today I am covering a tip that I also cover in the new tutorial. The hardest part of sewing with patterns is getting that "made for all" pattern to fit your "only made for one" body. The frustration in that can be the reason many never venture past the first attempt and although a seasoned seamstress I still find commercial patterns to be somewhat frustrating so I am going to share what I do before I even cut my pattern. I am making myself a button up collar shirt with cuffs and the classic back yoke but I know that the chances of my getting a good fit from following the measurements given to me on the pattern envelope are slim to none and therefore before I spend a good hour fiddling with fit after I construct the shell I pull out a shirt that I have in my closet that I LOVE the fit of but don't always find at the stores on a regular basis. I use this shirt to give me the information I need to transfer that to my pattern. 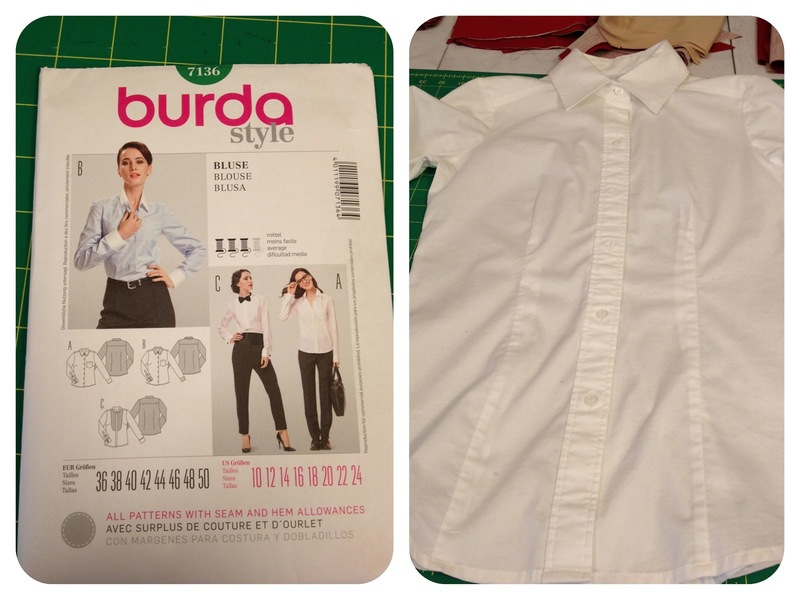 This is the pattern (Burda 7136) I plan to use and the shirt I already own. I chose this pattern because it has the most important similarities to the shirt I want to make. It has the right type of cuff, collar and band and back yoke. 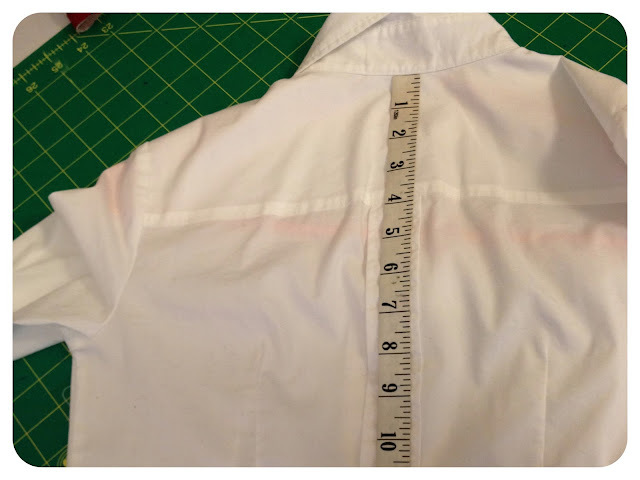 The pattern has bust darts instead of the darts at the body like my shirt but that is less relevant to me and since I will be pulling measurements from my shirt I can adjust and always add darts for fit. 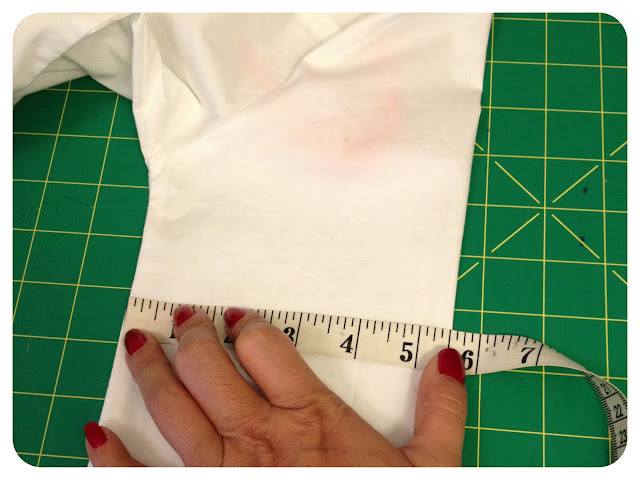 I NEVER go based on the measurements on the back of the envelope but instead use the FINISHED measurements printed on the pattern itself as a guide. This will help you BUT it is not always accurate and it is rare that those finished measurements will work without needing to make fit adjustments However, doing my simple tip before getting started will save you time!! Start taking measurements off of the shirt you already have and know it fits. TA DA!!!! okay maybe not a national secret but trust me it works. The hardest thing to do is fit yourself while standing in the mirror wearing a shirt and trying to pin and tuck while moving; and unless you have a "fit buddy" or "dress form" to help you it can be rather difficult. I will need to take measurements of the most critical fitting areas for this shirt to look the way I want it to right? so here are the areas I need to tackle for a good fitting shirt. 1. 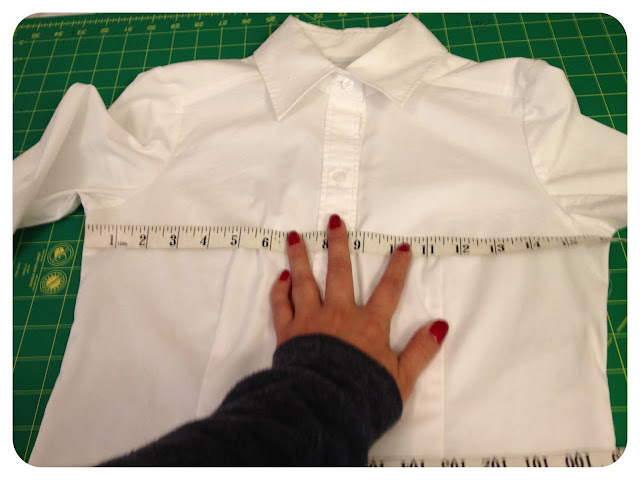 Lay the shirt buttoned up on flat surface, you will be taking measurements across the body and then you can later divide the #'s in 2 and transfer them to the pattern. 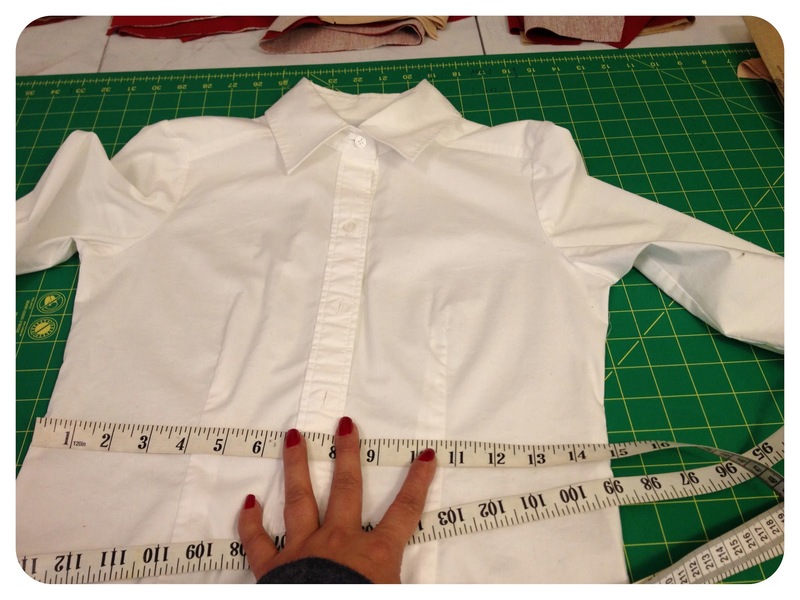 Now that you have taken the measurements you need you can then use them when you cut out your pattern pieces. 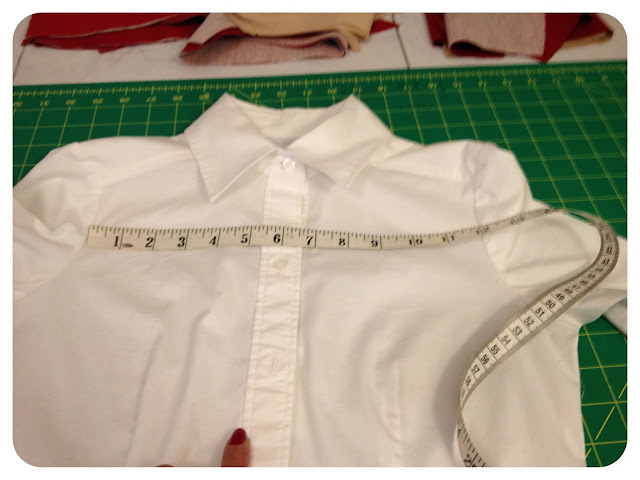 The measurements you just took not only help you as you are cutting your pattern pieces out but they already have the exact amount of EASE you like because the measurements were taken from a finished shirt. 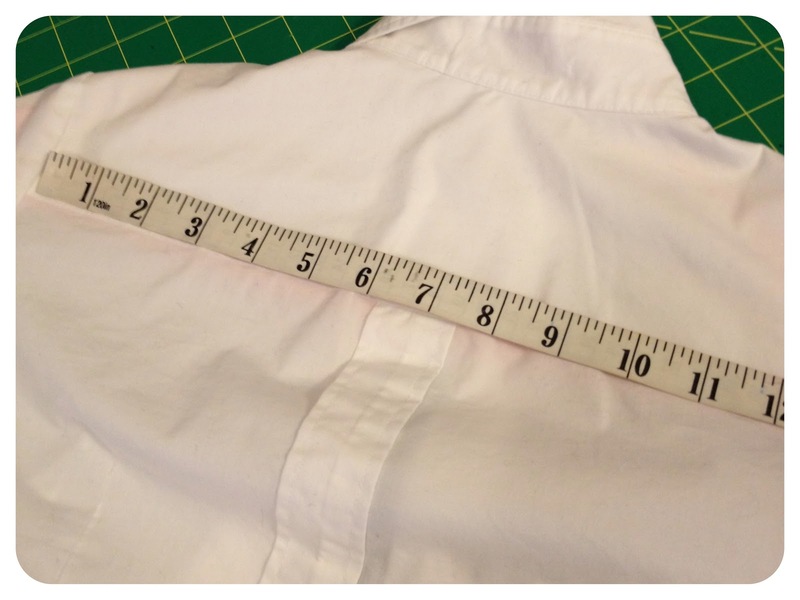 The finished shoulder seam measurement on my shirt is 4 1/2 + 5/8" seam allowance I need to add giving me 5 1/8" BUT when I cut out the front piece of the pattern and measure the shoulder seam n the pattern it may be 5 1/2" that means that I know I need to remove 3/8" to get the same shoulder width as my RTW shirt. Once I make all the markings on my pattern pieces of the correct measurements I can start to grade or "shave off" what I don't need. 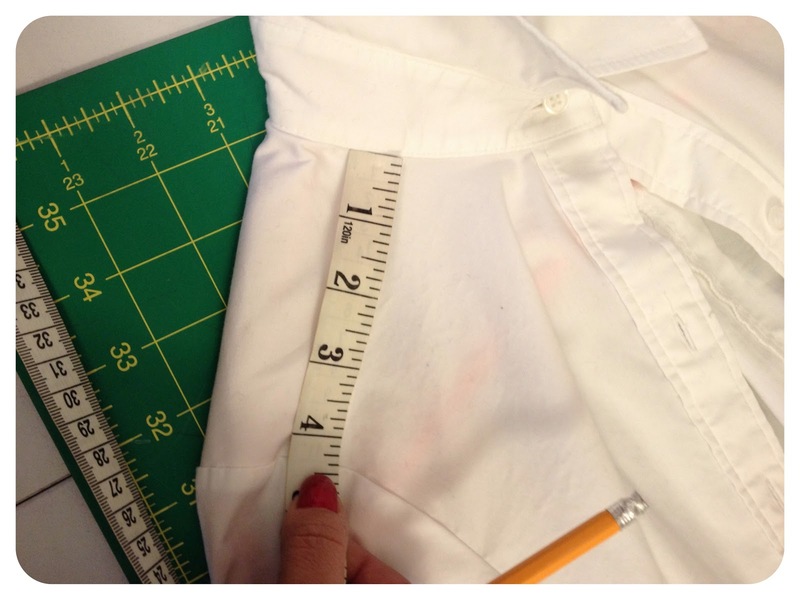 Now, Grading is a not easy and really complicated to explain (although there are basic grading rules) but if you are a newbie this already sounds cryptic to you but once you start understanding how to translate garment measurements of items you like the fit of to your commercial patterns it will become easier to grade patterns effectively. THis is right on time!!! I am going to begin sewing clothes again and wondered how I would be able to get the fit right. WHat an awesome idea. Thanks for freely sharing this particular advice. You are such a blessing, Mimi! Great tips Mimi! Fitting my patterns to my body is something I definitely need to start doing. I normally cut out my pattern and pray for the best, LOL. Can't wait to see the tutorial! Thank you very much for your posting; after a few crashes when using patternsI started to use the finish garment measurements closest to mine. Now you have given me an alternative to avoid any future errors, thank you again. Happy New Year to you and yours. This is such a helpful tutorial. Thanks for taking the time to put these tutorials together. Thanks Mimi. After many years of sewing I am just now starting to read and understand patterns. I still have problems, and like another stated here, I cut the size I think will work, and hope for the best. i thought i was the only person who always had to make additional alteration once a garment was finished. Thank you, newbies like me appreciate such info. I love this post - can't wait to see another great Mimi G tutorial. Mimi, this is a fantastic posting! Simple instructions , easy to follow. Have a great day! THANK YOU SO MUCH MIMI FOR SHARING THIS INFO.....IT WAS VERY IMPERATIVE....THIS HAS BEEN A BIG STRUGGLE FOR ME!!!! OMG!! you're so smart! I never that of doing that. I swear every time I read your blog you inspire me to keep sewing. GOOD DEAL!! OMG!! You're so smart. I never that of doing that! I swear every time I come to your blog you inspire me to sew. Great post, Mimi. 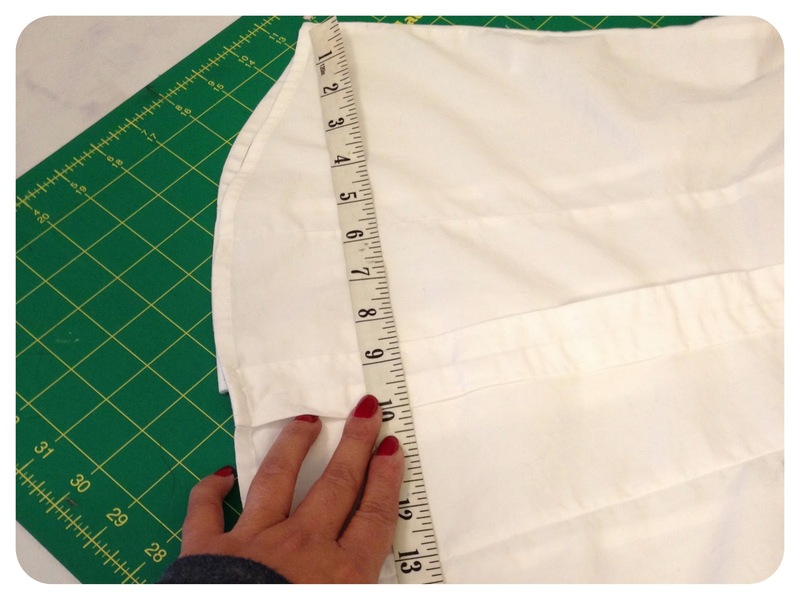 I do use the finished measurements on the tissue for sewing, but I have never bothered to measure and work from something I already own. Great strategy. I can't wait! I get so frustrated with patterns, especially pants! I look forward to the video. I think the elbow patches are a brilliant and practical touch. I just learned more about how to do professional-looking appliques using the satin stitch at a Vogue Fabrics demo yesterday. Tips could help with elbow patches. Key take-aways: use 30 weight rayon thread, metallic or embroidery needle, KK2000 spray to temp stick applique to proper spot, Steam a Seam for the applique itself, heavyweight stabilizer called stiffy is good for wovens (you need this on underside of fabric.) For sweatshirt fabrics,use Totally Stable stabilizer on wrong side of fabric. Brilliant post! Thanks so much for the great tips! I'll definitely need to try this soon.